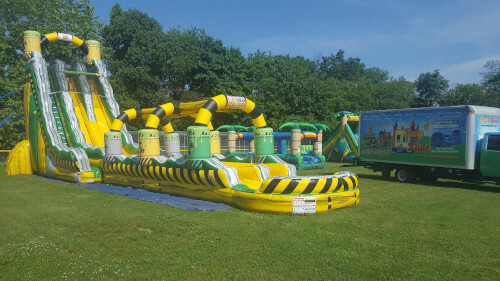 Jump And SLIDE has all the NEWEST and coolest waterslides that you will only find here. 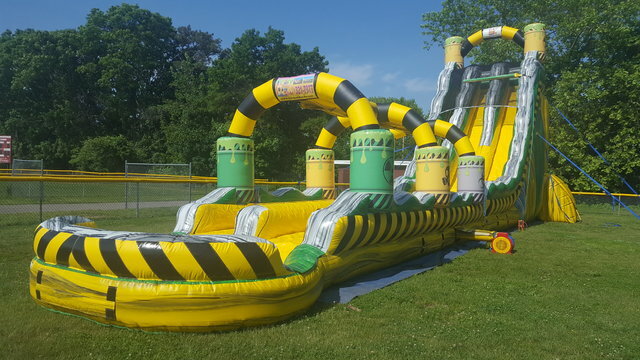 Take a look at the cool vibrant colors the toxic waterslide has to offer. Check out all the graphics on those toxic barrels.. Kids are going to be screaming for joy once they see this GIGANTIC 2 LANE WATERSLIDE WITH POOL IN YOUR YARD. Speaking of screaming….Not only are the kids going to be screaming…I guarantee you some adults will be screaming as they are propelled down the super-fast waterslide..
Don’t allow yourself to be disappointed…If its available now?? BOOK IT NOW!!!! !